We are in mid week counting down the weeks before Canvas of Words -Preserving Our Roots paints Queens with it’s words on the canvas! And speaking of paint! The visual artist who will showcase his talent is none other than Hosannah Myse! On October 11, Myse will paint on site!!! He will hear the poets, feel the energy, see the visuals and conjure up a master piece. Because that’s what he does! Myse has ‘expanded his work into design and illustration commissions. Album art, book illustration, store window display design and surface design are some of the areas that he has created works for. Clients include Saks Fifth Avenue, Asics Onitsuka and actor/musician Christopher “Ludacris” Bridges. In addition his work is in public and corporate collections, including the Alliance building Group and The Rogosin institute in New York City. His current work includes exterior and interior art installations. I have asked him three questions that pretty much sum up why this Canvas of Words production is different and why it would be in your absolute best interest to attend. Beauty, Brains, and Blogging: Can you tell us about yourself and the fantastic work you do as an artist? Hosanah Myse: I’m a British born artist who got thrown into the urban culture of NYC in the 1980’s. During my early years in NYC I focused most of my work on painting murals throughout NYC, with special emphasis on the neighborhoods that support the MTA 7 line. While my earlier work focused on Hip Hop culture my later works evolved into more abstract forms, for example right now I’m painting a lot of work in my Alchemy Urbana Style which is energized urban art absent the letter form. Not to be limited, my work runs between a variety of styles such as realism, surrealism, cartooning and surface design. If I had to explain two themes that run through all my work they are intensity and power, all my work has these two elements. BBB: What will you bring to Canvas of Words Preserving Our Roots that’s different from the work you do? H.M : Since my work is always evolving I’m not entirely sure what I will create for Canvas of Words. I will say that I will absorb what the energy, flow, style of the poets that are part of the event, spin it through my mind, and splash it out via the paint brush. How that energy comes out is highly intuitive so I never really know what I’m going to get, which I like. BBB: What made you want to be a part of this year’s Canvas of Words Preserving Our Roots? H.M.: Canvas of Words is a Queens based poetry hub, there is a lot of talent in queens but yet queens isn’t really known for the arts. Art is necessary for a healthy civilization, state or town. Art expands minds, broadens possibilities and brightens the mundane, so you could say that Canvas of words helps expand the creative consciousness of the community, which I highly support. What an interesting and rich repertoire Myse has. I am looking forward to see what he comes up with during Canvas of Words- Preserving Our Roots showcase! As Myse mentioned, “Art is necessary for a healthy civilization, state or town. Art expands minds, broadens possibilities and brightens the mundane.” Because not only are we honoring our heritage and paying homage to our history so that it maintains alive, we are keeping our roots well soiled, passing down our stories to the generations that follow through poetry and painting– the arts! And in this way we continuing opening our hearts and soul to create art! 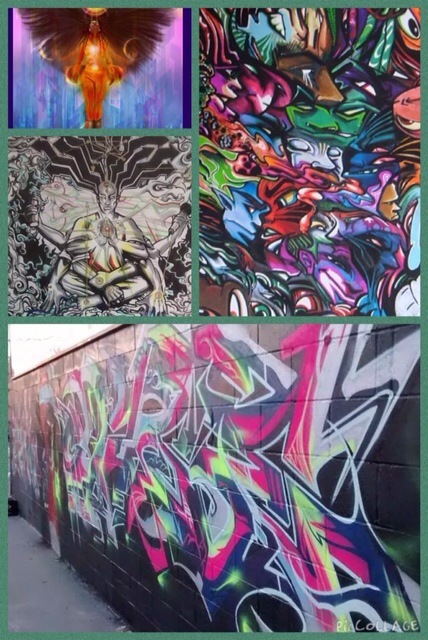 See collage below of some of his pieces. Please join us October 11. Let Canvas of Words broaden and expand your artistic horizons! I am an educator, lover of books, lover of words and anything that stimulates my mind. I am a member of the NYC Latina Writers Group who is currently working on the story of her life.